Why not just put solar panels on the car. Imagine you drive 30 miles to work, you could get 8 hours or so charging time while you're working. Which could mean you have plenty of battery to get home. Even if it took longer to get to a full charge with solar panels, you'd hopefully still have enough power to not have to worry about getting home. With the extra bonus of you didn't have to pay for the electricity. So imagine the current line of thought. Your battery has been charging overnight. You drive to your destination, a short journey. You pay to park in a charging bay, and charge you car while your gone. Lets be honest parking cost enough on its own at the moment, were expected to pay even more to charge up! Now imagine, the same scenario with solar panels. You've charged up overnight. You drive a short journey to your destination. 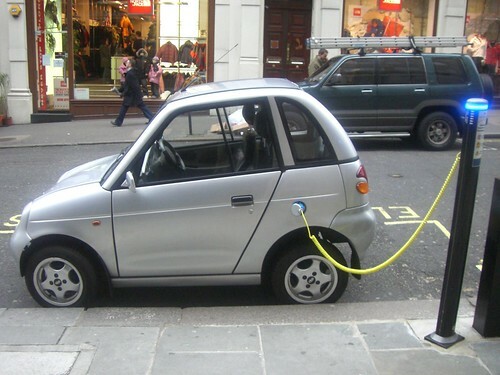 you park anywhere outside (maybe you can even find somewhere free, but probably not) and charge your car in the day light. Even better, you drive your short journey, your battery isn't that low; but you plug into a charging bay, indicating how long you'll be gone. Your car aims to be fully charged by the time you're back, so it combines the solar panel and the mains charge to get you there. You only pay for the mains charge. The best. You drive your short journey, and park in a charging bay. But you can easily reach a full charge from your solar panels alone, by the time you return. So the electricity you generate from the solar panels is fed back in to the grid and you get paid for it. How amazing would that be! Not only do you get paid to park, but you're also helping the environment by powering other peoples electrical devices. This could be the future. ***could***. Probably not as oil companies would hate it!